I’m grateful (and jealous!) 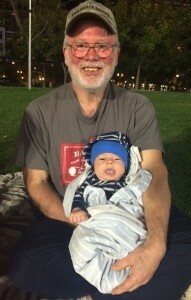 Brian is getting a lot of quality Grandpa time with Luke. Brian, Steven and Luke went to a baseball game together. I’m grateful I found the best planner/organizer ever. I bought myself a Tools 4 Wisdom planner and I love it. I now have myself more organized and efficient. I looked at the Passion Planner too, my friend Jennifer of Celtic Complexion uses this one. I liked Tools 4 Wisdom better because of the spiral binder. They are both great tools to keep yourself on track. I’m grateful I was able to see Holly of Lotion Bar Cafe last weekend. Holly is so positive and upbeat and just plain fun to be around. Her attitude is infectious and I need more Holly’s in my life. I’m grateful I was able to say no to 2 things I was asked to do last week. It’s hard for me to say no, I like to make people happy. But lately I have no time to do the things I want and need to do. Saying no to those 2 things is a step in the right direction. I think “Thank you for thinking of me but I’m not able to do that” will be my new mantra. I’m grateful Roslyne of Maya India makes Periscope seem so easy and fun. I think I may try it.